This October, we've got some highly anticipated heavy hitters coming your way! 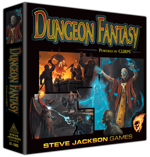 Munchkin gets a new entry point, as well as some Shakespearean accessories, and Dungeon Fantasy RPG gives players everything they need to get started, all in one box! All the monster-killing fun in an easy-to-learn set! Go down in the dungeon. Fight every monster you meet. Stab your rivals in the back and steal their stuff. Grab the treasure and run! 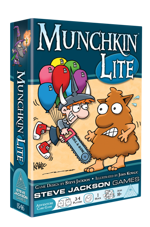 Munchkin Lite is a slimmed-down version of our classic card game, meant for smaller tables and faster games. Kick down the door and you'll be looting rooms in no time! Featuring new art on a host of classic cards, all drawn by John Kovalic. Six dice – that's enough for a star and five understudies! Tired of passing a single die around your board when your cowardly friends run away from monsters? 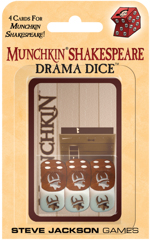 Never fear, you'll never be out of Munchkin Shakespeare dice again! This set also has four Munchkin Shakespeare bonus cards. So roll with your role, and tread the boards! Is it two bees, or not two bees? Keep track with a Kill-O-Meter! 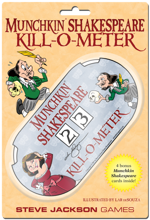 With the Munchkin Shakespeare Kill-O-Meter, whenever a card hits the table, you turn the dials to keep track of your new total. You don't have time to stop and count when the show must go on! The Munchkin Shakespeare Kill-O-Meter also comes with four special Munchkin Shakespeare bonus cards, and it's all illustrated by Lar deSouza! So let the curtain rise, and consider the only question that really matters: To loot or not to loot? Storm Dungeons. Slay Monsters. Seize Treasure. A fun hack 'n' slash campaign challenges unique heroes with clever dungeons, so you need a game that lets you customize and perfect characters, monsters, treasures, and traps. That's where the ready-to-play Dungeon Fantasy Roleplaying Game comes in. Choose from 11 classic professions and nine races. Tailor your hero using quick-start templates and the time-tested GURPS point-build system. Gear up with a massive list of customizable armor and weapons. Pick from over 400 spells. Then battle foes chosen from more than 80 monsters. Harness the customizing power of the award-winning GURPS, streamlined to give you exactly what you need to take fully realized characters on fantastic adventures. At your fingertips (and away from prying eyes!). 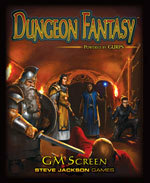 This sturdy screen will also foil the classic hack 'n' slash tradition of "accidentally" glimpsing the GM's notes, so the players will have to satisfy themselves with the beautiful full-color art on their side. But they're welcome to exploit the included 16-page booklet, which speeds up character creation and advancement by summarizing all the abilities . . . or the second booklet of 13 ready-to-use heroes. Old-school hacking and slashing calls for the right accessories - and this one is perfect for the GM who wants to set a swift pace and keep a few surprises hidden away!